Taking pride of place above the main entrance, this beautiful artwork will greet all visitors with the 99 Names of Allah. Each Name is available for sponsorship, and will live for generations as a testament to your support towards building The Ark. Secure your own calligraphic artwork today, and help us to build The Ark. For further information download the Ark 99 Names Brochure. Each octagon will be inscribed with one of the 99 Names of God. Each Name is a beautiful, calligraphed artwork in its own right, and will live for generations as a testament to your support towards building The Ark. 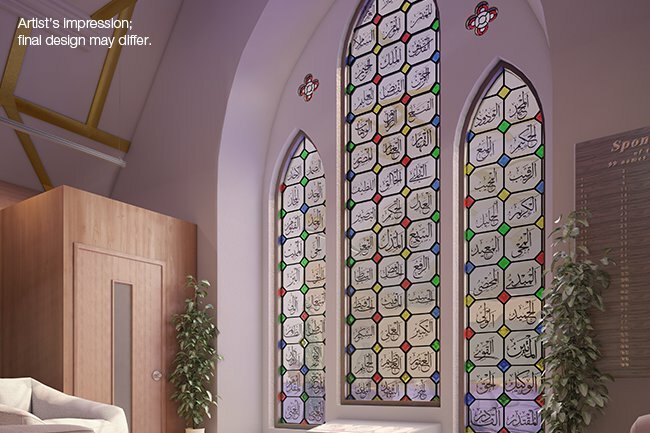 This beautiful stained glass window be repaired to show the Names of Allah in all their glory, with specially commissioned artwork. It will be a focal point for the whole building. There are only 99 Names available, Once they are gone no more will be available. Each patron's name will be displayed showing which Name they sponsored. This artwork will be enjoyed for generations to come.